Imagine taking a crash course on the history of Madrid, the Spanish capital and one of Europe’s most vibrant cities. The “professor” is really fun and interesting. And just for good measure, your “classroom” is the actual place, not a staid room with a chalkboard. That sums up this amazing 3-hour guided walking tour through the center of the city, filled with intriguing tales of history, an insider’s view that is hard to gain unless you’re a resident or a historian, or a resident historian. When we travel, one souvenir we like to bring back with us is a better knowledge of the places we visit. This 3-hour walking tour of Madrid provides that knowledge and more. Meet your guide, a scholar on city’s history, architecture and culture, in Isabel II Square, a landmark that is representative of the kind of urban changes brought in by the 19th-century monarchy. Walk through the medieval core of the city, which has remained remarkably unchanged since the period when the Habsburgs occupied the Spanish throne (1506–1700). 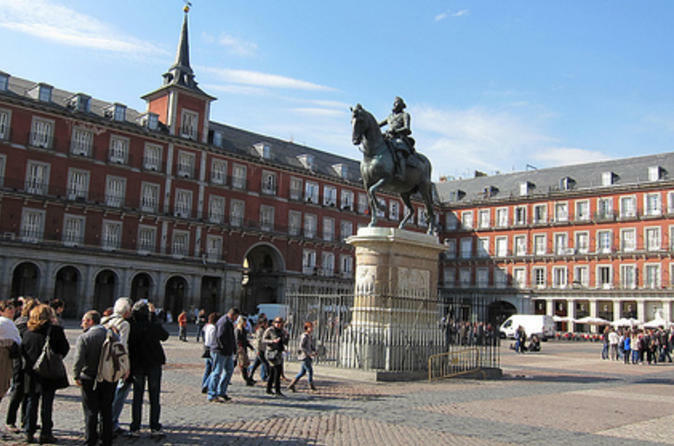 The first stop in this area is the Puerta del Sol, the epicenter of Spain’s highway network and the site of the popular uprising against the French in 1808. Visit the Plaza Mayor, a, intimate square surrounded by ornate buildings that almost feels like an enlarged courtyard. Today the plaza is lined with quaint restaurants and bars. The tour wraps up afterward, leaving you free to explore the center of Madrid.